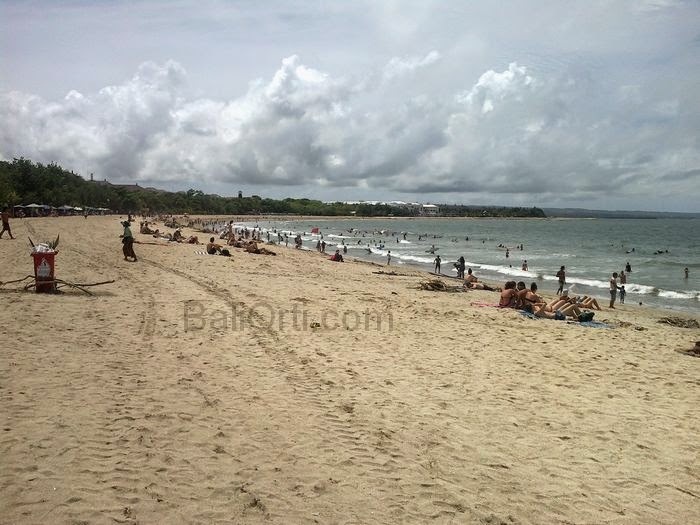 Three beaches in Bali, Kuta beach, Legian beach and Seminyak beach, has now become a hell for foreign tourists who are on vacation. The rainy season that routinely occur in Bali, have an impact on coastal conditions become soiled by garbage. Garbage that was on the beach, coming from rivers around the coast. The trash washed up and piled like a mountain. Mountains of garbage are very large. Piles of garbage per day reached 150 tons. Kuta beach so not worth a visit during the rainy season. The rainy season in Bali occurred when the end of the year and the beginning of the year. Regular rainy season occurs from October to April. When the rainy season in Bali, in some areas there will be a flood. Rivers also become very dirty due to water and bring garbage to the river. Rain sizzle will happen when in December, January, and February. Seminyak Beach is a very nice beach to see the sunset. But the beauty of the beach will be lost if a lot of garbage piling up. The trash from the river. Seminyak into hell during the rainy season. Seminyak so not worth a tourist attraction during the rainy season in Bali. Legian Beach is also going to be hell during the rainy season. Pantai Kuta, Legian and Seminyak, is the beach which is located on the same region. This beach is famous for its great ocean waves for surfing. The beach area is also very nice as a place to see the sunset during the afternoon. But the beauty will be lost when the garbage piled up on the beach. Many tourists feel disappointed when visiting the beach when there is garbage piling up is very much. Ironically, the garbage is not only derived from nature, such as leaves and twigs. Garbage in Kuta mostly from households and markets, plastic, tin, wood, also leaves. Garbage problem in Kuta, Legian and Seminyak, in the attractions area of Kuta Beach, Bali, the amount of garbage that comes increasingly uncontrollable. In fact, the entrance gate to the beach was filled with piles of garbage. In an effort to reduce the volume of waste that is getting worse day, entire businesses are located on the coast deployed. Hotels, restaurants, bars and a number of kiosks deployed to clean the beach, because they benefit from the attractions around them. This condition is very poor, rubbish everywhere so there is no place to accommodate. All places on the beach filled with piles of garbage. We all should be concerned, that we can do is clean up the garbage, collected in one place. Expected with the condition of waste that has been getting worse in Kuta, the government quickly took the solutions and steps forward in waste management. As every year the garbage always be a problem. This issue every year is always a problem for the tourism industry in Bali. It should be overcome for dealing with problems that may re-occur next year. In Kuta, Legian and Seminyak, piles of garbage into selfi photo background for the foreign tourists who are on the beach. Garbage is piled up on the beach to be photos taken by foreign tourists. If the image is viewed by their friends and relatives, then the image of Bali tourism will be even worse. Kuta Beach and the surrounding areas will be known as the beaches are filled with garbage. It is one thing to see rubbish piled up everywhere......but when taking a swim in the ocean to have toilet paper wrap around your leg.....that to me is quite bothersome because it tells me that the sewage is being washed into the ocean causing all sorts of potential health risks.... why...why...why...when you have a natural beauty such as Bali would you do this to your home?